For most anime fans, New York Anime Festival didn't begin until 2pm on Friday, December 7th. 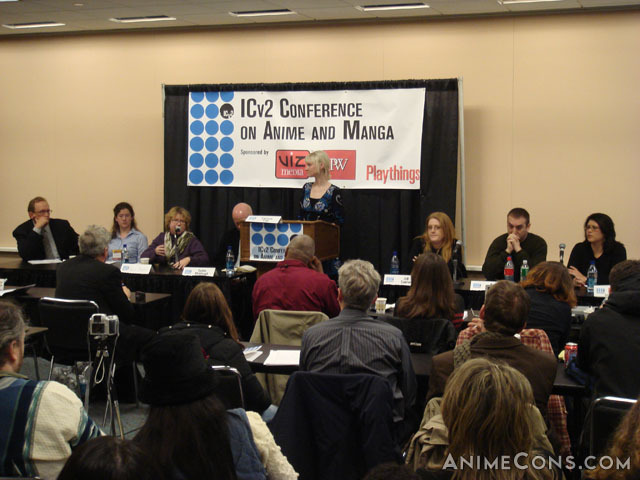 For press, industry, and anyone who opted for drop a lot of money on tickets, they could start early with the ICv2 Conference on Anime and Manga. It was held between 1pm and 5pm in one of the meeting rooms of the Javits Center while dealers were busy setting up and getting ready for the first day of NYAF. The conference, which was presented for a professional audience, featured four panel presentations: ICv2 White Paper- Anime and Manga, Marketing to the Otaku Generation, Girls- The Other Half of the Otaku Generation, and Technology and the Otaku- The New Media Frontier. 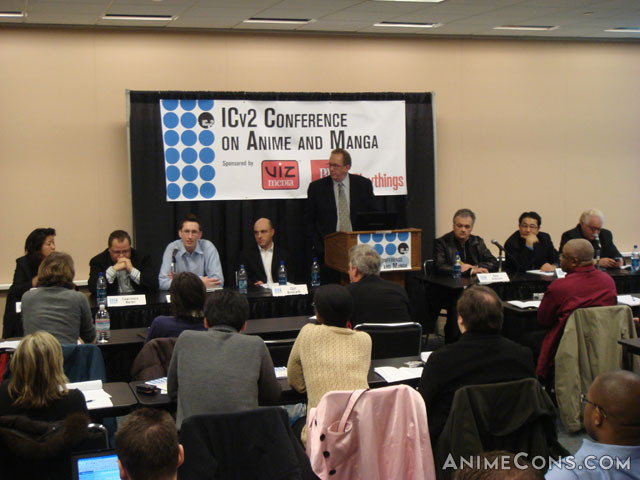 Discussion during the "Marketing to the Otaku Generation" panel was remarkably dull until a controversy arose when Al Kahn of 4Kids Entertainment declared Japanese manga "dead". He claimed the only reason graphic novels were doing well now was due to movies like Spiderman and Transformers. Rich Johnson of Yen Press vehemently disagreed and pointed out that "the graphic novel boom began before Spiderman 1 came out." Given Mr. Kahn's view, one panelist even wondered aloud, "Why are you even here?" His view of the state of the manga industry seemed to alienate him from most of the people in the room. In a discussion of merchandising, Gen Fukunaga, President and CEO of FUNimation, stated that anime merchandising doesn't work. Without naming names, Anime News Network's Chris Macdonald told of one company that wasn't shutting down a fansub site because it generated merchandise revenue. Sometimes just getting their product onto retail shelves can be a challenge. Liza Coppola, Sr. Vice President from Viz Media, said that one way they overcome that difficulty is by creating their own shelf space with spinner racks. However, according to Rich Johnson, Co-Publishing Director from Yen Press, it is easier to get Japanese products on the shelf than domestic titles. Mr. Fukunga attributed this to more buyers being educated with their products now. However, Mr. Kahn expressed difficulty with products outside of DVD and other proven products that buyers feel they may not be able to sell. Naturally, buyers worry about getting stuck with products that don't move off the store shelves. The discussion moved on to the issue of lag time between Japanese and US fandom. Naturally, the issue of illegal downloading came into play. As illegal video downloading has become much more prevalent in the last year, it has really hurt the anime industry. However, 4Kids says they're still getting 4 million downloads per month on demand, which demonstrates that some fans are willing to download legally if it is available. Mr. Fukunaga and Mr. Macdonald felt that the ideal solution would be a simultaneous launch of titles. While it was suggested to "shutdown piracy as aggressively as possible", that's often difficult or impossible to do with distributed downloads and multiple foreign governments and laws. Chris Macdonald said that there are ultimately two groups of fans at the core: collectors who buy things they want on their shelf and consumers who just want to watch stuff. While collectors will continue to buy anime, piracy could be reduced by giving consumers an easy and inexpensive way to continue to watch their titles. The iTunes Store was mentioned as one solution by several panelists. Lawrence Neves, Editorial Director for Pokemon USA, said that they are okay with a six month lag, but worry about information leaks on such things as names for Pokemon. Over at Viz Media, they are trying to shorten their release window and add value to a DVD to give it more value over a download. Mr. Kahn predicts that it will all be digital just as the iPod changed the music industry. As far as manga goes, Mr. Johnson didn't feel that an adequate book delivery system is out yet and that people still prefer to sit down and read an actual paper book over a computer screen or some sort of e-reader like Sony's or Amazon's products. Mr. Kahn felt that Japan has spawned a subset of people who think they can do what has been done in Japan and felt that Korea would be the next hot source now that Japanese manga was "dead". Opinions of Japan aside, Mr. Johnson named two very successful manga created by fans in North America: Megatokyo and Dramacon. Both of these titles were created by fans using manga styles in their own work. Mr. Macdonald felt that it's natural for them because it's what they read growing up. Not surprisingly, most of the discussion during the "Girls- The Other Half of the Otaku Generation" panel centered around manga. The panel touched on anime and other licensed products as well. Lillian Diaz-Przybyl, Senior Editor for Original Global Manga Development for Tokyopop, said that they have had success with OEL manga. She cited Dramacon as "a good crossover title" for people who may previously have been only willing to pick up Japanese-originating titles. However, she considers it to be a "growing craft" as they grow their editing process at the same time. They are in the process of testing new talent and committing on a smaller scale. Larissa Faw, an editor for Youth Markets Alert who was moderating the panel, asked if there had been any controversy over some manga titles. Nobody cited any specific cases of controversy and panelists seemed to believe that the self-rating systems companies had in place helped prevent controversy. Kurt Hassler, Co-Publisher from Yen Press, encouraged free speech. "There is value to explicit material." While there had not been any controversy, Dallas Middaugh, an Associate Publisher from Del Ray Manga, said "If it happens in the next five years, it's not something which will cause the manga industry to fall in on itself." In terms of anime, Mr. Hassler said that broadcasters feel that anime is for boys. As a result, shoujo is never given due process. Ms. Diaz-Przybyl said that Japan is simply not producing equal quantities. Jill Snider, Senior Brand Manager for FUNimation, said that Cartoon Network has told them that their advertisers want shows with toys, such as Naruto, Dragonball Z, and One Piece. Girls tend to be more interested in manga than watching TV, but they have tried pitching shows to Lifetime and WE networks. Mr. Middaugh said that while girls and boys will watch boys' animation, boys won't watch girls' animation. Also, boys will watch the same thing over and over and over again. "Girls are a little bit smarter than us." This panel was all about the shift to digital delivery via on-demand programming, computers, and cell phones. Moderated by ICv2 President Milton Griepp, panelists included Peter Heumiller, VP of Content Development for Comcast; Daniel Marks, Sr. VP of Strategy and Business Development for Viz Media; John Nee, Sr. VP of Business Development for DC Comics; and Jeremy Ross, Director of New Product Development for Tokyopop. The discussion started on digital downloads. Some of Viz Media's titles are available through Toonami Jetstream. Viz, DC, and Tokyopop are all investigating digital download methods for manga. Mr. Ross said that they often provide previews of manga on the Tokyopop web site and hear comments from fans such as, "If you hadn't put it online, I wouldn't have read it and I wouldn't have known how good Dramacon is." Still, they're "trying a lot of different things in a lot of different ways." Asked if anime and manga consumers differ from other customers, Mr. Nee said that anime consumers are more likely to be early adopters. 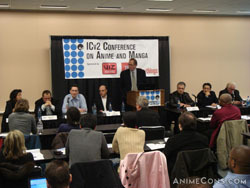 Mr. Heumiller admitted that the consumer anime viewer is the perfect audience for video on-demand. In a discussion on digital delivery, panelists were asked how companies can compete with illegal downloads. "You can't," replied Mr. Marks. He said that until the Japanese system changes, there is no way to compete. Mr. Ross felt that companies needed to come up with ways to get people to want to get the product from them, perhaps in some sort of iTunes-style solution. In terms of digital downloads of manga, Mr. Nee pointed out that even though the entire series of Megatokyo has always been available for free online, the books continue to sell well. He remarked, "Digital will help the sale of physical goods." Mr. Heumiller said that Comcast is launching a store to conduct "sell-through" of various titles. Mr. Marks pointed out that there is a difference between streaming and downloading and sales of downloadable titles are down. As far as trends go, Mr. Marks said that cease and desist orders are not effective for fighting piracy and are "effective for about five minutes." The different laws in different countries also make enforcement difficult. Mr. Ross said the industry needs "creative solutions other than playing a game of Whack-A-Mole." Eventually, the industry may see more direct distribution, which makes him wonder, "At what point will we become irrelevant?" The first New York Anime Festival opened at 11:00am on Friday, December 7th. At this time, many of the dealers were doing their final setup and most of the people wandering the show floor were staff, volunteers, exhibitors/dealers, press, and professionals/industry. Regular attendees were not allowed in until 2:00pm unless they were willing to pay $150 or $200 for a "VIP Ticket". A normal three-day badge at NYAF cost more than $50, which is unheard of for a first-year anime convention...but then again, NYAF is not really a first-year convention. It is run by Reed Expositions, a publicly-traded event organizer. Reed also runs New York Comic Con, which is likely the only other Reed event that most attendees were familiar with. From the layout of NYAF, it seems as if Reed was using their comic convention as a model rather than looking at how other anime conventions are run. The main focus of the convention's layout was undoubtedly NYAF's dealers' room. Everything was centered around it both physically and on the schedule. With the exception of Friday's masquerade and Saturday's concert, everything else closed down when the dealers' room closed at 7:00pm. Unlike most other anime conventions, there wasn't a large selection of programming available in the evening which left fans to fend for themselves for the evening. During the day, NYAF packed the schedules of their four panel rooms and four video rooms full with a variety of programming. Each room was dedicated to a different purpose through the convention: an anime panel room, manga panel room, anime culture panel room, anime fandom panel room, an anime screening room, live action screening room, and screening rooms dedicated to ADV and FUNimation titles. The convention also had a main stage (sponsored by Tokyopop), an "anime club lounge", a manga library, video game room, and a maid cafe among other destinations. Perhaps the biggest disappointment out of these locations seemed to be the maid cafe. A number of people complained how the girls dressed as maids would just stand by the entrance, greet people, and pose for photos. Unlike an actual maid cafe, people were not served by these maids in any way. What NYAF had provided amounted to no more than cosplayers standing in the equivalent of an American-style food court. After the convention, people were also alerted to a scam that took place at the convention. A dealer known as "VTS Travel" was calling people telling them that they had won a trip to the Bahamas. The "winners" were asked to provide a credit card number to finalize everything. NYAF has urged anyone who has had contact with VTS to contact NYAF management. As for attendance, attendees were finally allowed to enter the convention on Friday at 2:00pm. Although the place seemed more active, dealers were quite concerned about the low turnout by the end of the day. They paid around $1000 for each booth space, which is more expensive than even the largest anime conventions in the US. They were told that NYAF expected "20,000 people", which seemed a bit unrealistic. By Saturday, attendance had clearly increased significantly. By Sunday, the attendance level had dropped back down to a level similar to Friday's level. Although word had gotten out that NYAF was claiming 15,000 people were at the convention over the weekend, nobody who was there seemed to believe it. Press, dealers, and staff from various conventions, all of whom had seen many conventions of varying size, all seemed to agree that the attendance over the weekend seemed to be equivalent to that of other conventions which had reported around 8000 people. Many found the claims of 15,000 to be ludicrous. So where could these claims of 15,000 people come from? It's likely due to excessive distribution of badges. Aside from the dealers, who were issued 10 badges with each space reserved, AnimeCons.com talked to multiple people who were in possession of multiple badges. There were some exhibitors who also had "Professional" badges and some press who also had "Exhibitor" badges in their possession. One person we talked to told us that he forgot his badge and was issued a new badge on the spot, no questions asked, no list checked, no identification verified. With such a liberal distribution of badges, it's no wonder the attendance estimate we were hearing was so much higher than other conventions of similar population. The higher attendance of Saturday seems to indicate that most attendees came just for one day: Saturday. This isn't surprising considering the high hotel prices in New York during the holiday season. It was difficult-to-impossible to find a decent quality hotel in the city for less than $300 per night. Hotel prices that high are definitely a turn-off to anime fans, most of whom are on limited budgets. Without a discounted convention rate at local hotels, NYAF is likely to remain a "commuter convention" attended largely by those living in the New York City area. It will be interesting to see how New York Anime Festival evolves in the future. Will they look toward anime conventions to see how things are run there and how fans expect them to run (such as holding the masquerade on Saturday night)? Will they remain in December, which is normally a time of year in which people are too busy with holiday shopping to think about attending a convention? Will they add more evening programming, a convention hotel, or re-work their maid cafe? There's no way to know, but we're sure they'll continue to issue press release after press release with every detail. Most dealers we talked to seemed to be taking a "wait and see" position on returning next year. That's the position we're taking too. New York Anime Festival has a lot of room for improvement and needs to undergo a fair amount of change in order to become the premier anime event that they seem to strive to be.